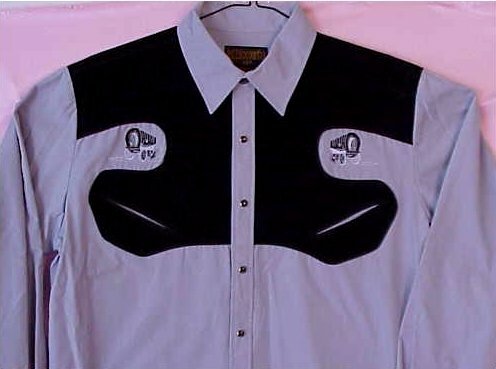 This has got to be one of the NEATEST and MOST UNIQUE western shirts I have ever seen! I kept one myself. Naturally females can wear these too. It is very well made. The fabric is sturdy and a bit thick. It feels like 100% cotton, but is amazingly a poly/cotton blend; you won't believe it. The top shoulder panels are made of a midnight navy ultrasuede . The back shoulder area is covered with it too. The front hidden pockets are real. The buttons are VERY DARK mother of pearl snaps. The appliqued wagons are just FANTASTIC. I've never seen anything like them. It is one QUALITY SHIRT sure to get a reaction at a HORSE SHOW or just around the ranch. Satisfaction is guaranteed or returnable with buyer paying all shipping costs.